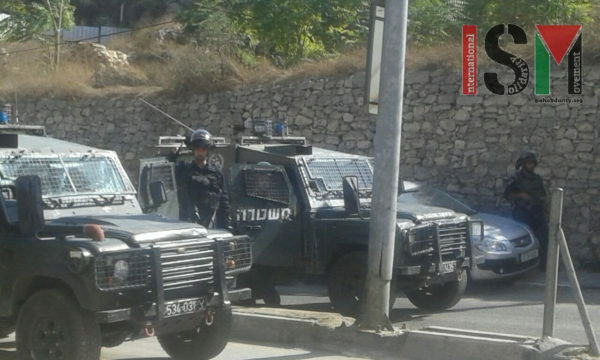 Shortly after noon on October 19, Israeli Forces began congregating on the militarized H2 side of the Shuhada Street checkpoint in occupied al-Khalil. A massive gathering of international Jewish tourists and settlers from the nearby illegal Israeli settlements followed shortly after. This is nothing new for the people of occupied al-Khalil – every year during the week of Sukkot, the Jewish Feast of the Tabernacles, Israeli forces shut down part of the central square of Bab al-Zawiye to form a “safe zone” for settlers and tourists. Palestinian civilians forced to stand back as Israeli forces take over area outside Shuhada Street checkpoint. First to exit the checkpoint into the so-called Palestinian controlled H1 area were the Israeli forces. After forming a human barrier around the two armored cars that had just arrived from around the corner via an H1 street, additional soldiers marched up towards a supposed sacred site in order to line themselves up in the “safe zone” formation. Once this had been done, massive groups of settlers and tourists began walking along this now-militarized Palestinian street. By this point, snipers had set up on rooftops, soldiers had sound bombs at the ready, and Israeli forces of all colors were spontaneously aiming their weapons at unarmed Palestinian civilians as a form of intimidation. Jewish tourists and settlers from nearby illegal Israeli settlements walk up and down the now-militarized H1 street. These “safe zones” are simply additional tools used by Israeli forces to further their ethnic cleansing operations in occupied al-Khalil. The military setup of the operation presented a distorted and dehumanized spectacle of Palestinians as wild, bloodthirsty animals that needed to be controlled to the settlers, when in reality these people were only seeking to shop, socialize, and live their normal, everyday lives. By demonizing Palestinian civilians as “terrorists” and presenting their military offenses as “security operations”, Israeli forces have sought to justify their illegal incursions into the H1 area. These incursions present an ample opportunity for arrests and acts of violence against Palestinians, in many cases leading to the clearing of Palestinian residents to make room for additional illegal Israeli settlements. Therefore, not only are these guided settler tours and the militarized “safe zones” they conjure up used as a powerful zionist propaganda presentation, they are in fact part and parcel with Israel’s process of ethnically cleansing al-Khalil of its indigenous Palestinian population. At no time is this practice so consistently played out annually than during the week-long Jewish holiday of Sukkot. 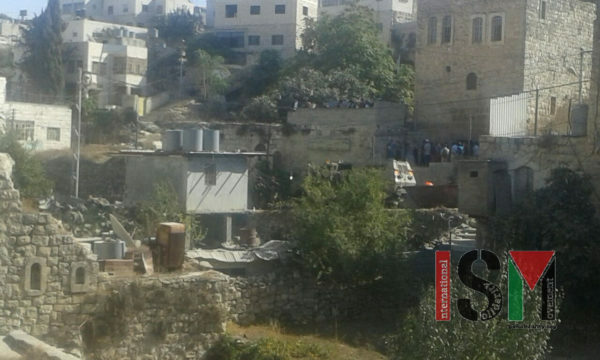 Every year in occupied al-Khalil, settlers and tourists from Israel and abroad are bussed in by the truckloads towards the al-Ibrahimi mosque. Israeli Border Police block off roads leading to the settler tour destination, doing whatever they please to modify the physical boundaries of the occupation. The mosque becomes shut down for Palestinian Muslims and many of the checkpoints throughout the city are closed at random points with no prior warning. As Jewish tourists set up tents on the lawn in front of the mosque, many abandoned buildings (former homes of evicted Palestinians) are refitted into military bases. 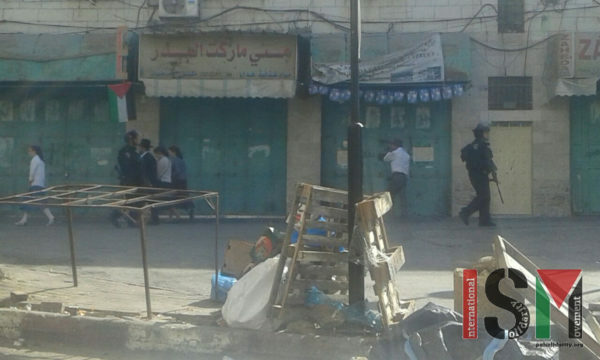 Students from the nearby schools are forced to walk to and from school past this military madness every day of the week, and young male Palestinians are stripped searched for weapons while Israeli settlers are allowed to walk by fully armed to the teeth with assault weapons slung across their bodies out in the open. 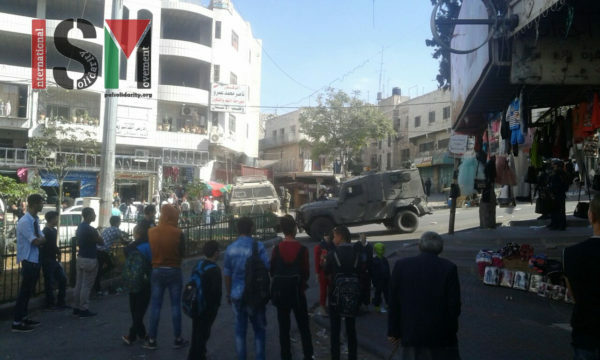 What happened today in the thriving Palestinian center of Bab al-Zawiye is nothing new for the people of occupied al-Khalil. It is simply a systemic occurrence of the slow and violent creep of ethnic cleansing by the state of Israel towards the people of occupied Palestine. 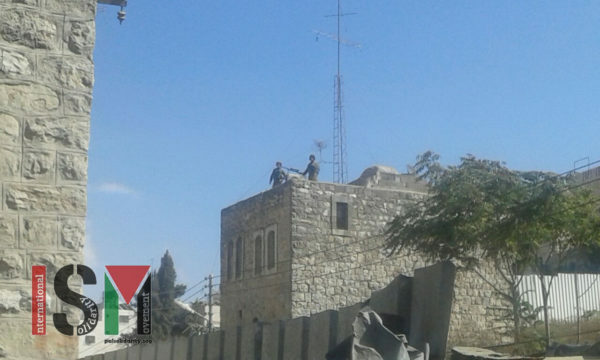 Snipers line the rooftops of H1, aiming at Palestinian civilians as a form of intimidation. All of this violent intimidation just so that Jewish tourists and settlers can pray in this house for a few minutes.